An infant rests in an incubator at the Alaska-Yukon-Pacific Exposition. Courtesy of Sideshow World. One of the stranger scientific trends at the turn of the 20th century was the exhibition of human beings. Familiar to many are the tragic tales of native peoples exhibited as curiosities; less known, perhaps, is the display of young infants to showcase new technologies. Among these displays was the “Infant Electrobator” at Luna Park in West Seattle. In 1907, Luna Park sought to become an amusement park to rival no other. It boasted water slides, carnival amusements, and refreshments (along with a well-stocked bar). But one of the attractions that people flocked to see was the Electrobator, a line of incubators powered by electricity in which supposedly premature babies were placed to be cared for under the public eye. The curious visitor could watch as nurses cared for children throughout the day. Luna Park was an early venue for such displays but it was by no means the only one. In 1909, the Alaska-Yukon-Pacific Exposition would make babies a prominent part, going so far as to raffle off Ernest, a one-month old orphaned child. (Although there was a winning ticket, it was never claimed–leaving Ernest’s fate a mystery to the present day.) Inspired, perhaps, by Luna Park, the Exposition also showcased premature babies, charging admission to reimburse the costs of their care. Many of the children involved, though not all, were orphans. A daycare center was attached to the exhibit so that fairgoers could leave their own tots to be watched by the exhibition’s nurses. 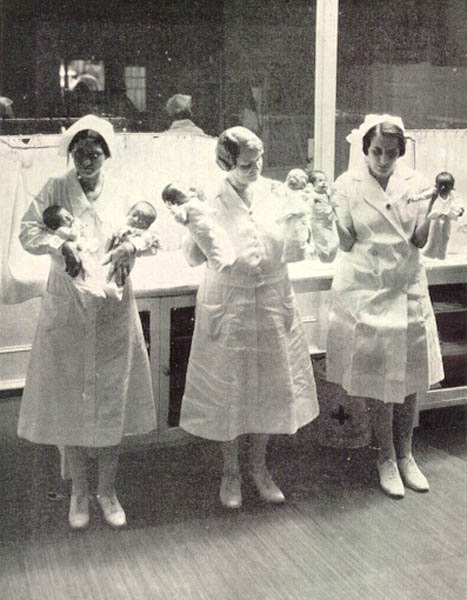 Nurses from an exhibition at Coney Island hold up the premature infants in their care. Courtesy of neonatology.org. A number of other expositions worldwise hosted baby incubators for the public to observe. Why was this so popular? The culture of scientific curiosity at the time encouraged people to view the young infants. Though such contact may have been detrimental to our modern view of health, incubation was at that time a little-known idea. The doctors and scientists who worked on the devices felt that this was one way to bring the needs of premature babies to the forefront. It was also argued that these exhibits saved lives–all of the babies on display in Berlin survived in a time when 98% of all premature infants died. Babies were often obtained not only through the referral of doctors but from desperate parents, hoping for answers in a time when premature birth wasn’t recognized as a treatable condition. Was the medical treatment worth sacrificing children to the public eye? Were the incubators truly successful? How genuine was the scientific curiosity of spectators? Could scientists have gotten the funding to continue treating premature children without this kind of exposure? The stories around the incubator exhibits raise all of these questions and more. Were we to mount such exhibitions today, how would they be received? These are all interesting facts to consider in looking at an era where modern medicine once felt more like science fiction. 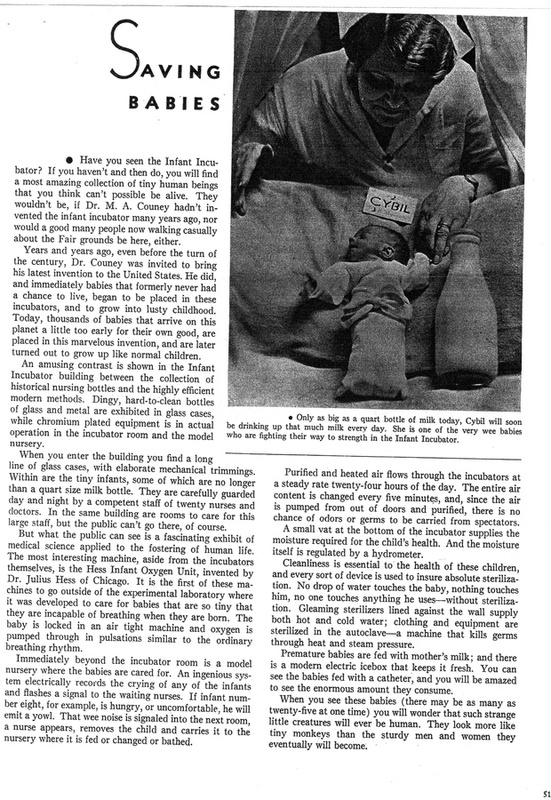 You can find more in-depth information about the history of incubators and their exhibition in the article “Sweet Lullaby on the Midway” by Patricia Miller Clayton. To see personal photographs from one of these exhibitions, visit this page about the Coney Island incubators. PBS also discussed the exhibition at the Chicago World’s Fair on their show History Detectives. An article from that fair is available here.